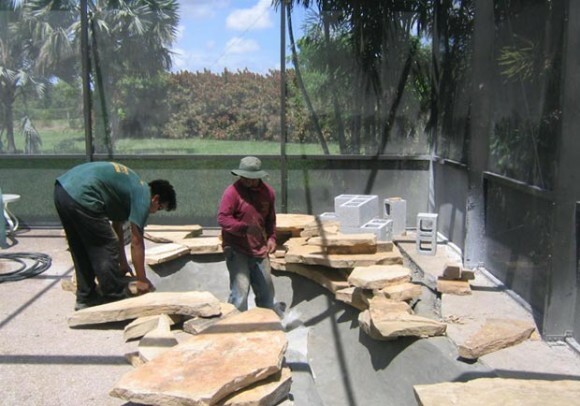 Landscape installation is the process of installing plants, water features, rock formations, retaining walls, walkways & patios and other outdoor structures, so all facets of the landscape complement each other. Consulting a landscape designer who is local to Greater Miami to develop a master plan can save you money. A landscape installation begins with evaluating the master plan to determine what changes will be needed in the grade, what soil amendments are needed and what plants have been selected for installation. Native knowledge of foliage, flora and fauna is important for the life of your landscape. Once the master plan has been analyzed for all the appropriate elements, a landscape designer’s knowledge and experience come into play to determine the appropriate installation approach. Proper landscape installation is the ‘How To’ of landscaping. Anderson Landscaping can make your dreams come true when it comes to your landscape installation needs, whether you are looking for new construction, renovation of an existing landscape, a secret garden, a manicured lawn or irrigation. Anderson Landscaping does residential and commercial installs, as well as hardscape and water feature installations. We will add a professional touch to your new and existing landscape. We take pride in implementing the best practices in installation, maintenance and care. We pay attention to detail and we don’t believe a project is complete until you’re satisfied. Anderson Landscaping can design and install the custom landscape features you desire, contact us today at 305-978-2050 for a consultation.